What is the difference between “Electrical wall motion defect” and “Mechanical wall motion defect” following myocardial infarction ? Regional wall motion defect( WMD) is the hall-mark of myocardial infarction.It can vary between complete akinseia to mild hypokinesia. What causes the regional wall motion defect ? Finally , and most importantly the timing and arrival electrical signal to these ill-fated segments determine the sequential activation fronts. Wall motion defect is a more complex phenomenon than we would tend to believe. What are the the classical examples of electrical wall motion defect ? *LBBB causes a paradoxical septal motion with reference to lateral fee wall contraction.It is still a mystery , this paradoxical motion does not cause any mechanical disadvantage in structurally normal hearts . We know , LBBB due to ischemia or infarct carry a sinister prognosis . Here , there is “Double wall motion defect” . One electrical and two ischemic . We do not know , how LBBB influences the ischemia/Infarct related wall motion defect and vice versa. . This is the reason , there is a large chunk of poor or non responders for cardiac resynchronisation therapy. Can peri infarction blocks and other non specific intra ventricular conduction defects alter the sequence of ventricular contraction ? We do not know .It is distinctly possible.Tissue doppler studeis have indicated this. What is the influence of heart rate on the of Wall motion defect ? An otherwise insignificant regional wall motion defect could be amplified with tachycardia . Paradoxically , (as in a biphasic response to dobutamine stress test ) a significant WMD may be attenuated at a particular heart rate. So, the influence of HR on WMD is as simple as it could be ! ! ! Which is the best time to assess LV function after MI ? Considering these issues , LV function assessed at discharge , may not give us the exact quantum of muscle damage. 4 weeks may a reasonable time frame . This is important in the current era as presence of significant LV dysfunction becomes an indication for revascularisation .We can’t be offered, to err on this vital LV functional parameter. WMD is a combination of electrical, mechanical , structural, alteration in response to variety of myocardial insults.It is very hard to assess individual components contributing to the net WMA. The easiest and surest way to quantify WMD due to muscle damage is to do a deferred echocardiography , when all time related WMD ( Ischemic stunning , perinfacion block ) disappear. Diastolic wall motion defects .Is wall motion defects exclusive phenomenon of ventricular systole ? No , definitely not. Regional relaxation abnormalities are quiet common .it is poorly recognised . Bradycardia is a common cardiac arhythmia. Sinus bradycardia is often considered an arrhythmia from a disciplined heart. It denotes high vagal tone . A heart rate of 40 , some times even 35 is well tolerated . But bradycardia due to heart blocks are dangerous. Sinus bradycardia can not get lower than 30/mt or so , as invariably either the junction or the ventricle , escapes with its own rhythm. Near syncope, dizziness , giddiness followed by syncope occur as the heart rate slows progressively below this level .It is often taught humans can not survive when the heart rate goes below 10/mt . Here is middle-aged man who presented with a history of recurrent syncope over a period of 3 days . He has no history of CAD. As he entered the ER, this ECG was recorded. At this pint of time , when the ECG was recorded, he was conscious and talking , only to complain of little dizziness. After seeing this ECG , he was immediately put on a temporary pacemaker. 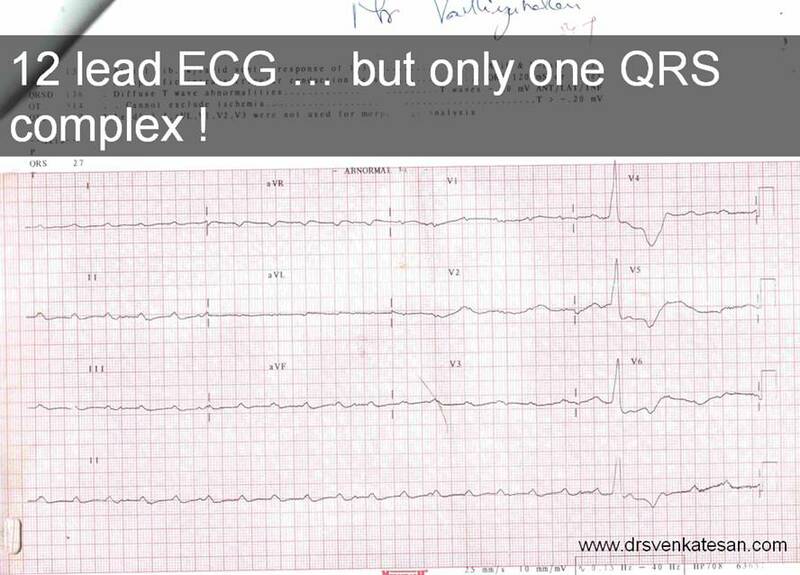 Note : The ECG shows a single qrs complex per tracing of 10 sec duration .Ie HR of 6 /mt.One qrs complex for 50 large squares ! .Divide 300/50 and HR is 6 . Note also the p waves fire at 150/mt due to atropine effect . The procedure took 15 minutes to perform , he was comfortable and was administered atropine , and isoprenaline *, which increased his heart rate from 6/mt to 10/mt . Later he went on to receive a permanent pacemaker a week later. * Temporary trans-cutaneous pacing using paddle stickers is an another modality available in such situations where trans-venous pacing is likely to be delayed . Cardiology’s ultimate moment of glory and truth is experienced when a life is saved with a pacemaker. Extreme bardycardias are often fatal , but here is a patient with dangerously low heart rate , still not resulting in asystole or brady induced VT/VF . We had adequate time to plan a strategy . Severe bradycardias need not result in cardiac arrest always. Some hearts have amazing capacity and their fighting spirit amazes us ! .It should be noted that , the above example may be an exception than a rule . There are about 5000 medical journals , churning out tens of thousands of articles every month .Most of these papers come from developed world where publication is made mandatory to get a medical degree . So it is not surprising to find proliferation of medical journals . Publishing a paper is strictly monitored by a peer reviewing system in most journals . But , it is also a fact an article rejected out right by a journal , invariably appear in some other journal. There is a joke going around among medical researchers, if it is difficult to get your article published in a journal , you start your own journal . . .It is much easier ! Further , bulk of current day research work is sponsored by drug and device companies .It is possible these papers may have 100% acceptance rate. Even in this scenario , it is heartening to find occasional excellent academic treasures and landmark research articles . How common is irrelevant , pseudo , futile , clinical research articles published in medical journals today ? I agree , I have prejudiced view on this issue . I would like to know am I really wrong ? What is your take on this issue ? Intriguing concepts in cardiology :Anemic heart ! Is it cardiac failure or cardiac success ? Anemia is one of the earliest human diseases that was identified. Traditionally heart disease and anemia have a close relationship. (Is it a true relation ?) .Most of us are made to believe so, by meager speculation ! In what way anemia is linked to heart failure? It is the inability or reduced capacity to pump that affect the tissue oxygenation. Or able to do so only at the cost of elevated filling pressure. Do they happen in severe Anemia ? Even though anemia partially and indirectly fulfills first half of the definition , it fails to result in elevated filling pressure of the heart. Hence anemia per se , may never* result in cardiac failure by definition. *Is there an exception to this ? Severe anemia( Hb < 5 grams ) is often thought to result in cardiac dilatation .At this point of time , some consider cardiac failure to be present. When does anemia produce a hypoxic injury to myocardium ? Hypoxic injury to myocardium due to extreme anemia is possible .In clinical practice it is rarely experienced. What is the effect of anemia on ECG ? Anemia is probably the commonest cause for the so-called non specific or( non ischemic) ST depression and T wave inversion. These changes are more pronounced in females. When sinus tachycardia also co exists (Usually it is ) ECG can perfectly mimic an acute coronary emergency.One should watch out for this possibility. Anemia causes mild enlargement of all cardiac chambers.This is first seen right-sided chambers. Diastolic dysfunction is almost unheard in anemia .As quick relaxation must be there to augment the next contractile beat. Anemia can cause high velocity turbulence across LV outflow( or even in the AV inflows.) This turbulence is seen as color variance in color doppler. But , since it is physiological , the flow velocities are not elevated much . Anemia and coexisting CAD . This is a distinct possibility , as both entities are quiet common in general population. In fact, anemia will worsen the underlying CAD. Anemia is an important cause of secondary unstable angina.Here, one should realise it is almost impossible for anemia alone (without CAD )to produce unstable angina .Even stable angina is rare in isolated anemia .If it occurs, anemia unmasks silent CAD. Anemia and associated cardiac failure. This has probably confused us a lot. They are often associated but the former plays an amplifier role than an etiological role. It would be a surprise , when the discussion here is “Anemia causing cardiac failure” the reverse situation could be much more common. ie “Anemia occurring due to prolonged congestive failure” . The bulk of the knowledge we have is related to this question . It is similar to anemia of chronic disease (Hypochromic , microcytic ) as in rheumatoid arthritis, CKD etc. This fact is being exploited by the industry for quiet some time now (Oh , a mouth watering role for erythropoitin in CHF ! ) .It (Amgen EPO ) miserably failed according to available inputs. There could be some truth in this conceptualization even though anemia can not make a myocardial contraction directly. Anemia with cardiac failure is not a true cardiac failure . In fact , it is not cardiac failure at all in many situations. Only in terminal state , the heart begins to dilate .Till that time the heart is actually in the hyper functioning mode. So , to call anemia as cause of cardiac failure is a misnomer . Ironically, in patents with isolated severe anemia the heart more often succeeds in its assigned job of supporting the heamic system in it’s hour of crisis. Should post prandial angina be classified as unstable angina? Stable angina is graded by Canadian cardiovascular society classification ( CCSC ) by 4 grades. Angina at rest usually denotes unstable angina. But, patients with stable angina may also experience rest angina according to CCSC , still this is not considered as unstable angina by many . Post prandial angina is one such example. Few consider post prandial angina as unstable angina . This sort of reasoning can not be faulted . In the logical sense , we are dealing with varied categories of unstable angina. The importance of diagnosing unstable angina is to intervene early , so that we can avoid major adverse outcome . The problem in CAD is , often , the plaques and angina do not obey the conventional rules ! .The following permutations and combinations could be observed in any coronary care unit . Among the above 6 categories 2nd is probably the most dangerous group and category 5 is most benign. Post prandial angina is a serious form of angina.It implies , even diversion of little blood to GI system immediately after a meal can provoke an episode of ischemia .This infers a very tight lesion somewhere in the coronary tree, very often it could be the left main or proximal LAD. Of course , there is another mechanism for post prandial angina, namely GI neurotransmitters like gut peptides acting as a coronary vasoconstrictor. Snippets on post prandial angina . It is also recognised , post prandial angina occurs more often during dinner, followed by lunch and breakfast. Carbohydrate foods are more likely to precipitate it . Does PPA cause ST depression ? Logically it should .In reality It happens in few . How to manage it ? It is very important to recognise , even though this article argues for including PPA as UA, there is no acute thrombotic process during an episode of post prandial angina . In fact , it is more of a secondary UA due to altered blood flow pattern. Post prandial angina has all the characters of a severe form of angina .There is every reason to label it as UA .It is suggested , ACC,ESC, AHA should consider including post prandial angina as UA or at least UA equivalent .This would help intervene this entity early. If you think you are an expert in “ECG diagnosis” of acute coronary syndrome : Please read this ! Once in a while the ACC/AHA comes with knock out articles. Here is a must read topic for every cardiologist. How to diagnose MI in ECG ? Sounds , insulting ? After reading this you should change the way 12 lead ECG is looked at . . .
How to make the best of lead AVR ? Just invert it and you get a + 30 degree lead which was hither to unavailable .A new window of opportunity to diagnose antero lateral MI . And lot more exciting tips ! When European heart journal published the article “Myocardial Infarction redefined ” in year 2000 many missed out the importance . For those who missed it (just 10 short years have gone by ) , Let us update ourself at least in 2010 ! Thanks to ACC and JACC. Why patients with dilated cardiomyopathy show high voltage qrs in precardium and low voltage in limb leads ? A combination of low voltage qrs and high voltage qrs is a well known marker of dilated cardiomyopathy . classically patients with severe forms of dilated cardiomyopathy show high voltage qrs complex in V1 to V6 and significantly low voltage in limb leads. This happens due to two reasons. 1 .We know , chest leads are unipolar and picks up the electrical activity directly beneath the lead. In dilated cardiomyopathy the enlarged heart (Usually more than 6 cm in diastole , may reach 9cm ) brings the myocardium closer to chest .This increases the electromotive forces reaching the lead. 2. The enlarged LV increases the residual end systolic and end diastolic volume , this increase in blood volume independently increases the electrical conductivity and inscribes a high voltage complex. Why limb leads do not show this high voltage ? The limb leads are bi polar leads hence as a rule , they record a smaller voltage than chest leads.In many patients with cardiomyopathy , the muscle mass is replaced by fibrotic tissue (Interstitial fibrosis ) and this brings down the net electrical energy draining from the heart. When can limb leads record high voltage in cardiomyopathy ? It should be realised conduction defects can cause an increase in qrs voltage irrespective of the status of the muscle .This happens due to LAFB,LBBB, non specific IVCD. Because , these conduction defects are very common in cardiomyopathy , there is very poor correlation of LV mass verses high voltage qrs . What is the correlation of low voltage to LV muscle mass ? This has better correlation a very poor voltage < 5 mm( the largest qrs ) in the limb leads predicts a very badly scarred LV .